As y’all may know, I can do very little amateur astronomy of any kind from home. An occasional look at the Moon from the porch or my annual Christmas Eve peep at M42 is about it. Too many lights, and, worse, too many trees, huge old oak trees that block the sky in every direction. If I want to see pea turkey, I have to get to the club dark site. When I was working 12 hours a day five (or more) days a week, that was a problem. The best I could do was a couple of nights a month. I worked a lot of weekends toward the end of my engineering gig, and by the time I got home I was often too tired to think about loading up a mess of gear and battling traffic, even for some blessed hours under the stars. That’s over, now. 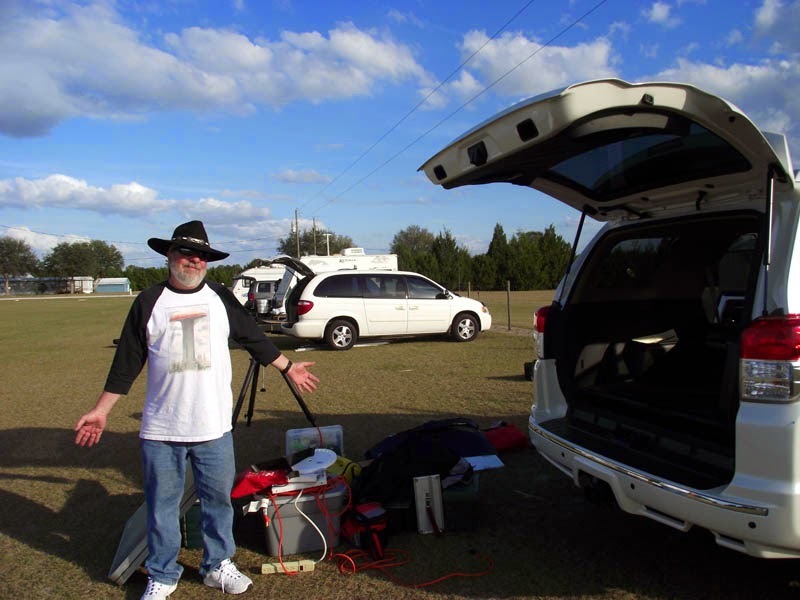 Since I am retired (well, semi-retired), there is nothing to keep me from visiting the Possum Swamp Astronomical Society dark site at least weekly. Other than the cotton-picking weather, that is. So it was that I decided to head out last Saturday evening. The weather was perfect. Only buzzing bug in the butter? There would be a near full Moon in the sky a couple of hours after sundown. That was OK, I’d find something to do. I could shoot Jupiter, of course, but I didn't think the seeing would cooperate enough for that to be worth fooling with. Well, then, it sounded like an RSpec night. As I wrote a couple of weeks back, I’ve begun playing around with spectroscopy using Tom Field's RSpec software and Robin Leadbeater's Star Analyser diffraction grating. The grating turns my humble little ZWO planet cam into a spectrograph. A low-resolution one, sure, but one capable of showing a surprising amount of detail in stellar spectra, nevertheless. The Moon wouldn’t do a thing to prevent me from imaging stellar spectra, but seeing was another matter. The consarned Clear Sky Clock (Chart) forecast seeing to be putrid at best. Still, I figgered giving it a go would be more fun than sitting home watching reruns of Wonder Woman on the cable TV. At 3:45 p.m. it was time to load up the good, old Toyota, Miss Van Pelt, for the journey west. What was different from last week? The telescope. Last time, the goal was lunar and planetary imaging, and I thought my older C8, Celeste, an Ultima 8 OTA, was a better bet than the Edge 800. The reason being the older scope is set up for a JMI Motofocus, which I figgered might make it easier to focus the Moon and Jupiter. Turned out not to be the case. In the eight months I’ve had the new SCT, I’ve become proficient at manual focusing again. I may set the Edge 800 up for Motofocus one of these days, but I am not missing it too much yet. I did miss having Mrs. Peel on the observing field with me last week, no denying it. One big reason for that, I must admit, is that she is just so doggone pretty and all with her slightly greenish Takahashi-white tube. I’ve loved orange C8s and black C8s and silver C8s, but for me white is still the color a telescope tube ought to be. Guess I’ve never forgot the look of the Cave and Unitron tubes of my youth. Appearance ain’t everything, of course, and there’s more to Emma than just that. Optically this is the best C8 I have ever owned with the best star test. “What makes an Edge different from a regular C8, anyhow, Unk? And how is it different from Meade’s ACF? I’m confused.” Well, of course you are enthused, Skeezix. Oh, you’re cornfused are you? Well I can edumacate you about the new SCTs in short order. 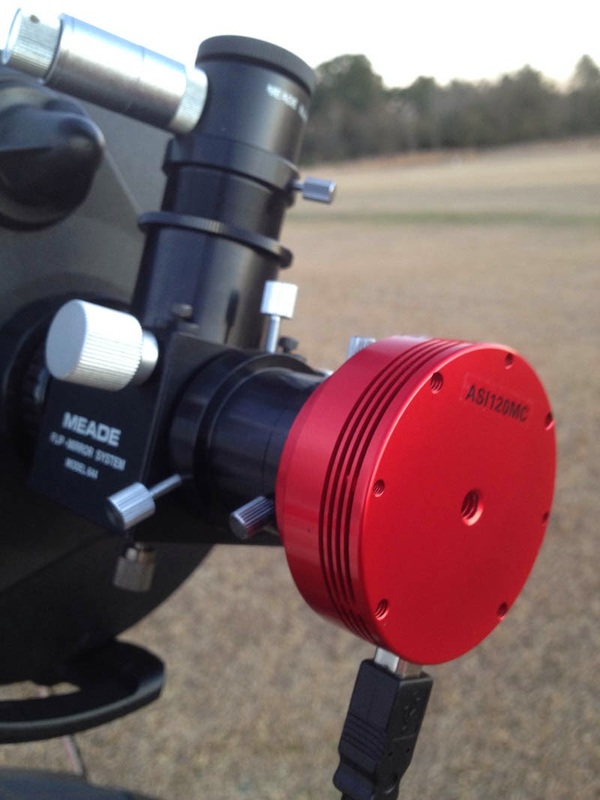 Meade’s ACF optics got there first, coming ‘round about eight years ago in the form of the RCX SCTs. The RCXs’ optics were different. In addition to having focal ratios of f/8, the basic optical design was changed. Instead of using a spherical or near spherical secondary mirror, the RCX used one that was a parabola. The goal was to reduce coma, which is one of the two things that make stars at the edge of an SCT’s field look more like comets than stars. An f/10 SCT has coma equivalent to an f/6 Newtonian. Not bad, in other words, but there. As you may know, the RCX was plagued by Meade missteps, starting with spurious claims, including that the telescope was some kind of Ritchey Chretien design and that the secondary was a hyperbola, and ending with horrendous quality control problems. Still, the idea of a reduced coma SCT was a good one, and the basic design, an aplantic SCT, not an r/c, was a sound one. 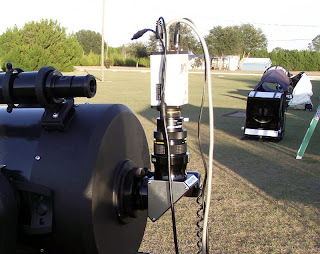 It has lived on at Meade in the form of the f/10 ACF (“Advanced Coma Free”) SCTs and the new f/8 LX850s and 600s. As has been the case for over 30 years, when one SCT maker does something, the other follows suit; that is the telescope arms race. Celestron was at this time probably better positioned to respond than Meade would have been if the situation were reversed. While Meade (who was bought out by the Chinese last year) was struggling financially, Celestron, who’ve been owned by the Chinese firm Synta for almost a decade, seemed to be doing well. They were certainly doing well enough to one-up the Meadesters. It wasn’t long before Celestron announced the Edge series of Schmidt Cassegrains. Not only would these telescopes, which included 8, 9.25, 11, and 14-inch OTAs, correct for coma, they would, additionally, flatten the naturally curved SCT field, taking the final step to fix Schmidt Cassegrain edge-of-field performance. 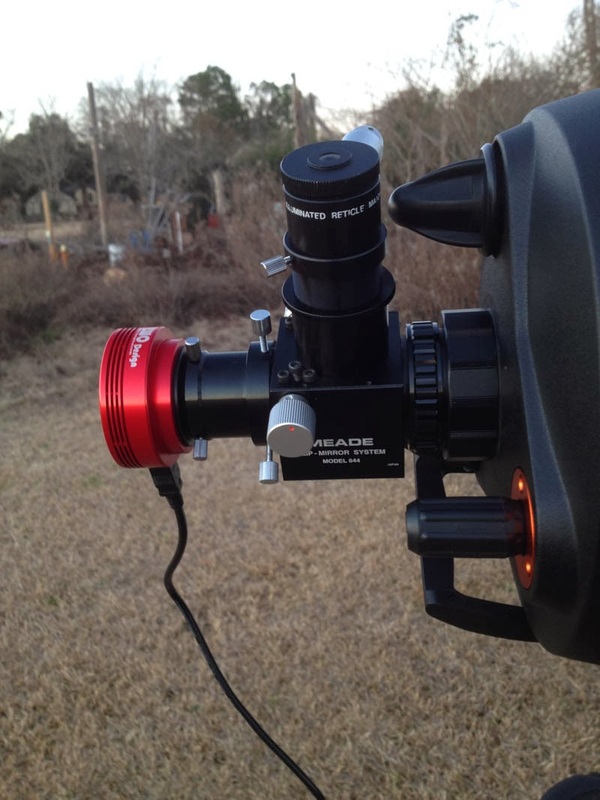 Celestron took an entirely different path to an improved SCT than Meade. The Edge’s basic design is almost unchanged. The back-focus distance, the distance from the rear port to the focal plane been altered slightly, but that is it. To fix coma and curvature, Celestron incorporated a two-element optical corrector in the baffle tube. And, though it took them a while to do it, the company also introduced sophisticated add-on focal reducers for the Edges to bring the f/10 scopes down to f/7 (but we are still waiting for one designed for the Edge 9.25). So what is the Real Deal on these telescopes? The Edges’ images are noticeably better at the eyepiece field stop than those of the ACFs, but it is not like night and day. The images in the Meades are very good indeed, with the 10-inch ACF of my friend Mike Harvey having some of the best SCT optics I’ve seen. Any advantages the Celestron has may be masked (for visual observing) by aberrations in your eyes or your eyepieces. In fact, you may find you don’t need either the Edge or the ACF, that you don’t need the More Better Gooder. I will be the first to tell you that visually the Edge 800 is a dream. You may have heard that using one is like looking through a superbly corrected 8-inch refractor. That is true, but what if, like Unk, you don’t do much visual looking? And when you image, you often use cameras with small chips like planetary cameras or the Mallincam deep sky video cams? The Edge (or ACF) improvements are at the field edge, and a small chip camera doesn’t see that. Same goes if you are mainly a planetary observer. You are concerned with the field center and don’t give a hoot ‘n holler about the periphery. And yet, and yet… While I don’t always take advantage of the innovations inherent in Mrs. Peel’s optical design, I still love her and have a hard time making myself use any other telescope. I’ve always loved C8s and she is the best C8 I have ever loved. She’s the best in part because of the care that was obviously exercised in her construction. Her finish is beautiful and flawless, and so are her optical coatings. As above, she shows a terrific star test. And I haven’t even mentioned her vents that speed cool-down or the mirror locks that eliminate mirror flop. In my opinion, if you are after a new SCT you owe it to yourself to at least consider the Edge. Hokay, glad we got that out of the way. Where was we? Oh, yeah. I’d just loaded Mrs. Peel and the VX mount into the 4Runner, shut the tailgate, and made tracks for the PSAS’ little patch of dark sky heaven. 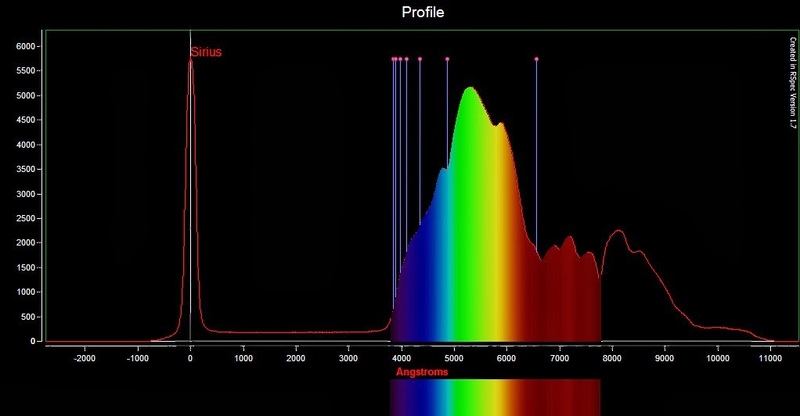 I’d put out an announcement on the club's Facebook page (no more Yahoogroup for we-uns) that I’d be doing spectroscopy and would be happy to have company. I didn't think I’d get any, though, it being a near full Moon. 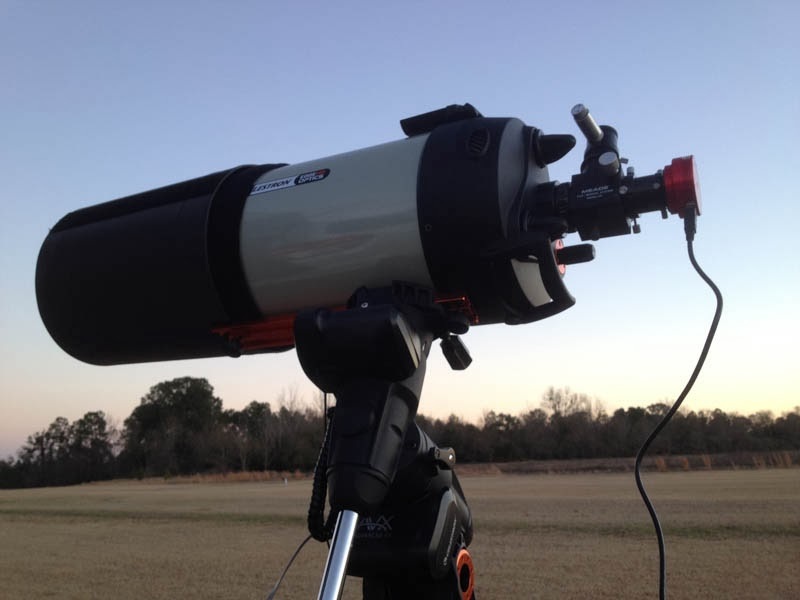 Unlike Unk, I would guess most of our members who want to observe Jupiter can do so from home. And, indeed, not a soul other than my favorite yellow tomcat, the airfield’s mascot, greeted me upon my arrival. He was eager to “help” me, and we soon had Mrs. Peel on the VX, the camera and the flip mirror on her rear port, and the computer fired up. As was the case last week, there was not a chance of clouds, obviously. Was it cold? Unk thought it was, the temperature having PLUMMETED into the mid 40s shortly after sunset. Luckily, this time I was prepared with a good sweater, a leather jacket, and a bunch of chemical hand-warmer packs. As far as the observing run itself, ain’t much to tell. I was using the ZWO color cam at f/10 through the flip mirror. 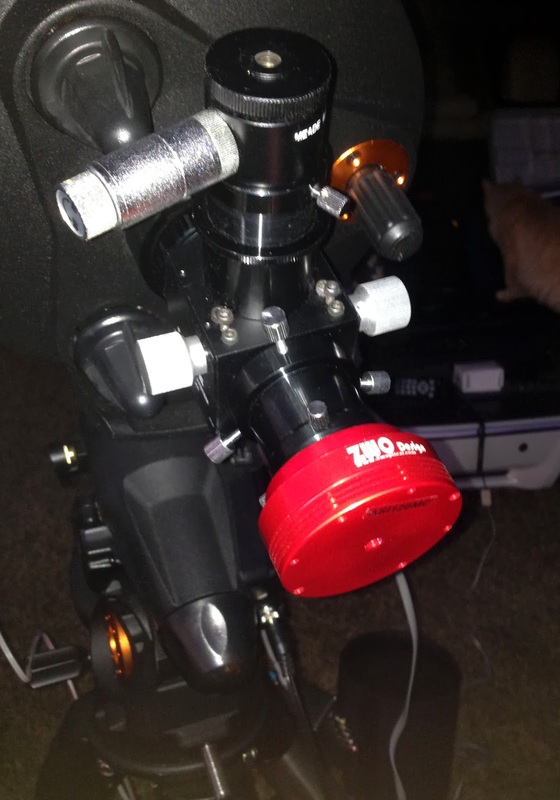 I mashed the buttons to go to the first star, fine tuned the aim a mite with the reticle eyepiece so the star and its spectra would be centered on the ZWO’s 1/3rd inch chip, flipped the mirror down, and headed to the computer. At the computer, I fired up RSpec, clicked the “live camera” tab, positioned the star and its spectra so the star was on the left and the spectra on the right (the program has an image rotation tool to make that easy), and, voila!, there was a live spectrum on the program display. I did one thing differently this time. I thought the spectra I got on my initial outing looked a little thin, so I upped the exposure a wee bit. Not much. Even at 80 milliseconds the ZWO is sensitive enough that I was on the verge of overexposing bright stars. Then it was just a matter of getting stars in the can. Since I am still just getting started with this stuff, I stuck to bright suns, the same stars I shot on my previous RSpec run: Rigel, Capella, Betelgeuse, and Sirius. The seeing wasn’t perfect, but it was at least a little better than on the previous RSpec run. Sirius was a little low and twinkling madly, but its spectrum seemed at least close to “good enough” to me. “So, everything went smooth, no hiccups, no disasters, eh, Unk?” Hey! This was an Uncle Rod observing run. It wouldn’t be normal if something didn't go wrong. The culprit this time was the hand control extension cable I bought years ago for the CG5. Its flat telephone style cord gave up the ghost completely yielding lots of “No Response” errors. I ordered a new and better one from Jim Henson at Scopestuff as soon as I got back to the Old Manse, since the cords on Celestron’s current hand controls are so absurdly short that you really cannot get by without an extension. Anyhoo, I persevered despite the HC cable problems, got at least two sequences of each star, and took a break. 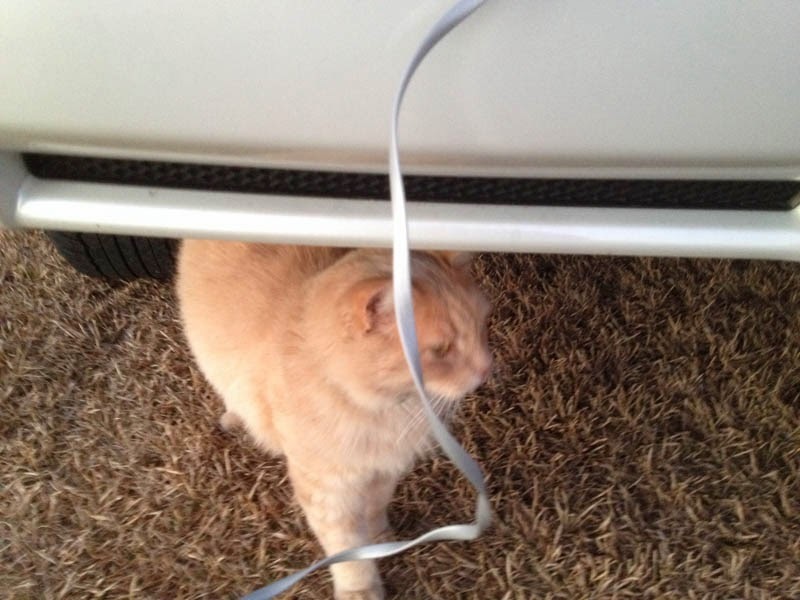 My four-footed friend had trotted back to his home in the nearby hangar. It was dark and it was lonely and it was cold. Did I get spooked? No, not really. The reason I decided to throw the big switch was because I didn't really have an agenda left. The old Moon was on the rise, which limited my options. Given the way Sirius looked onscreen, trying for Jupiter would have been an exercise in frustration. If I’d had a buddy or two on the field with me, I’d no doubt have hung out shooting the breeze and messing with the scopes a while longer, but I doubt the run would have lasted much longer even then. By the time I’d finished packing, Luna was up over the horizon looking in on me, lighting the field like a searchlight. I made tracks for the Old Manse. I was back home in plenty of time for Svengoolie, who was showing yet another 1950s SciFi “masterpiece,” The Mole People. I watched it, but it is really almost on the too freaky side today. It is just freaking odd, with its introductory lecture by a nervous English professor and an anti-Shangri-La plot that involves albino Sumerian mole people and a pretty girl. The film’s ill-concealed viewpoint, that the underground civilization is just another inferior non-western culture, tends to make us a little uneasy today, too. During the commercials, I must admit I had a peep at my spectra. Just looking at the .avi files with Windows Media Player, I was somewhat encouraged. There seemed to be detail in the spectra, more than there was in the ones from my first attempt, I thought. Also, when I’d been shooting the video, the real time spectrum display seemed to indicate I was picking up absorption lines. But I was really too distracted by the task of operating the scope to pay close attention. I’d only know for sure how good or bad they were on the morrow when I ran ‘em through RSpec. After my customary Sunday morning bowl of porridge, I pulled out the laptop and got down to work. Why did I choose to process the files on the laptop rather than on Chaos Manor South’s famous kitchen workstation, a high-powered Toshiba wide-screen desktop? Using what is essentially a video camera yields large .avi video files. At the ZWO’s highest resolution, which is what I habitually use, a short sequence is a gigabyte in size and transferring a dozen or more of those files to the desktop is a pain in the you-know-what. Maybe it’s a good time to talk about what you can use with the Star Analyser grating other than a planetary webcam-style camera like Unk’s. If you’ve got a still camera of some kind you can somehow hook to the grating, that’s it. RSpec seems to be very good regarding the file types it will accept. You can even use that new DSLR you got for Christmas. Adapters are available for purchase through Tom’s website that allow you to use the grating, which comes in a standard, threaded, 1.25-inch cell, with your camera either by screwing it onto the lens, or directly to the camera in a T-mount set up. Another popular option is Meade’s no longer produced DSI series of camera. While they've been gone for a while, many were made and it’s easy to find one of these basic CCD cams for sale in used venues. Certainly, you can use a big-boy camera like an SBIG with RSpec, too. RSpec can be configured to work in conjunction with CCD camera control programs like CCDsoft. For me, though, the ZWO is easier to use. 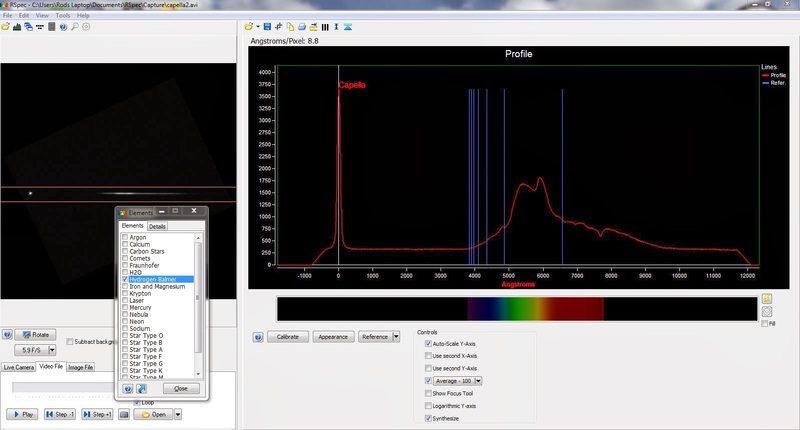 With video coming straight into the program, I can see the spectrum live on the computer display (remember, this program’s subtitle is “Real Time Spectroscopy”) and it’s obvious whether or not I’ve got everything working more or less correctly. Also, being able to take many frames and stack them with RSpec’s “Average” function makes it easier to deal with the punk seeing we get this time of year. Yes, even way down in the Swamp, seeing can be a problem in the depth of winter, especially a nasty winter like this one has been. I could see how just how bad the seeing had been when I began looking at my Rigel and Sirius sequences on RSpec. Their graphs moved up and down in “amplitude” like crazy. Not to worry. I clicked the Average button and their spectra, their graphs, settled right down. OK, time to calibrate, to change the pixel scale of the graph to angstroms (or nanometers if’n you prefer) so it would mean something. I’d just…I’d just… Suddenly Unk realized he was in over his head. I had absolutely no idea where the hydrogen beta line was and couldn’t click on it to complete the calibration process. 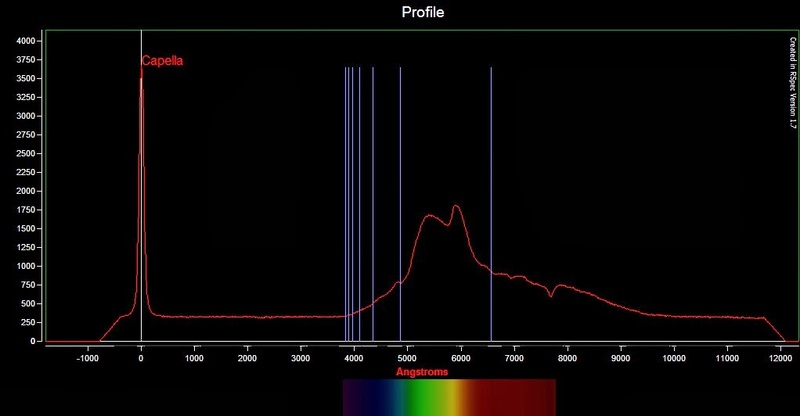 The more I looked at my spectra, the more confused I became. They looked different from the examples in Tom’s videos, and attempting to calibrate by guessing at the h-beta line led to crazy results. There was only one thing to do, run crying and screaming to Mr. Field and see if he could make heads or tails of my .avi files. Indeed he could, and far more quickly than I could have dreamed of or asked for. In short order, Tom got me going again. Part of my problem was seeing. It was, if not as poor as on my initial RSpec outing, bad enough to complicate things. What was also confusing me was that I was seeing the second order spectrum peeking in on the right. Once Tom educated me about these things and a few other factors and I was back on track. Next time I will try to work under better seeing and see if I can eliminate that intrusive and confusing second order spectra. Anyhoo, after Mr. Field got me calmed down, seeing straight, and thinking right I was able to successfully calibrate my spectra and pick out the Balmer Series lines and other things. Again, what I mostly think will help is better seeing—and more experience, of course. I’ve still got a lot to learn, but I sure am having fun doing it. Though my results were a little indifferent this time, muchachos, they weren't that bad, I thought. MOst importantly, I’d had fun, learned a lot, and, wonder of wonders, found something I could do on a winter’s night with the full Moon in the sky and the jet stream overhead. You cannot beat that with a stick, muchachos, you cannot beat that with a stick. A more appropriate title for this one might have been “You Can’t Win ‘Em All,” and ain’t that the truth when it comes to amateur astronomy? Especially right now when it seems we've had months of more clouds than clear. One thing I do know, however; you have to persevere. Sometimes punk nights can turn around. Anyhow, if you see anything, even just barely on a poor night, you’ll have seen more than you would have sitting at home watching Finding Bigfoot on the dadgum cable TV. What hurt most last Saturday night was that the evening didn't live up to its initial promise. Saturday morning and afternoon were beautiful. The next cloud-bearing front wasn’t due till Monday, and there was no doubt the clearing would hold all night long. I felt good, and had big plans. I’d start out doing lunar imaging. Too many weeks had passed since I’d had an evening on the Moon, and my Destination Moon project, my quest to image the 300 most prominent lunar features, was getting seriously in arrears. By the time I was done with Diana, Jupiter would be high enough to fool with, and I was eager to shoot pictures of ol’ Jove, something I haven’t done in a long time. Finally, I wanted to take more spectra with the ZWO camera and RSpec. I’d got a few the week before, but the seeing hadn’t been good, my exposure times weren't quite perfect, and I thought I could do better. The telescope? Instead of my Edge 800, I thought I’d drag out my old Ultima 8 OTA, Celeste. I planned to image Jupiter, and I thought the old scope would be easier to focus on a planet. She has a JMI Motofocus adapter, and I absolutely love that cotton picking Motofocus for planetary work. She’s never been a slouch as far as image quality, either. The trip west to the Possum Swamp Astronomical Society dark site was dang sure quicker and more relaxing than it had been the previous week, 45-minutes instead of over an hour. I am trying to get out to the site more often now that I am retired, and not just on Saturdays, so I’d tried out a Friday night for the previous run. Unfortunately, sundown coincides with rush hour this time of year, so, for now, Saturday is better. When I rolled onto the field, I wasn’t surprised not to see any of my PSAS buddies onsite. I didn't expect to have company. There was a Moon, a nice, fat gibbous Moon in the sky after all, and, unlike me, I reckon most of my fellow PSASers can do lunar and planetary imaging from home. Also, there was no denying it was on the chilly side. Even the site’s friendly tomcat didn't hang out with me for long. I chatted with him and his human, one of the owners of the airstrip, for a while, but they soon decamped for warmer environs, leaving Unk all by his lonesome to get the scope assembled and Destination Moon Night Four on road. Set up wasn’t hard: tripod on field, VX head on tripod, counterweight on declination shaft, C8 on mount. I screwed my Meade flip mirror onto the rear port—it would be a necessity for getting my targets onto the ZWO camera’s 1/3-inch chip since I’d be using it with a 2x and maybe even a 3x Barlow. Believe the voice of experience, y’all, with 4,000 mm of focal length and a small chip, it is a pain to get even the Moon in the frame, even with a good finder. While it didn't seem too damp, I installed the DewBuster heater strip on Celeste’s corrector end, anyway. Way down here in the ‘Swamp, there really ain’t any such thing as a dew free night any time of the year. And if you even think there will be dew, you need to get your heater cranking at sundown. It is much harder to remove dew that’s formed than it is to keep it from forming in the first place. Scope and mount ready to go, I plugged the Toshiba Satellite’s power brick into a little inverter (Harbor Freight) connected to a jumpstart battery. I only expected to go a couple of hours, but the laptop has a sizable 17.3-inch screen, and I’d be powering the camera from the USB bus, so its internal battery wouldn’t last long. I hooked the ZWO ASI120MC camera to the laptop via a USB cable and was ready to roll. All that was left was waiting for Polaris and some alignment stars to show. While I was waiting, I got a little cold. Nothing like the previous week—it wasn’t supposed to get much colder than the mid 40s this time—but it was cold enough. And, unfortunately, Rod forgot to bring his big cold weather coat. As y’all know, I always forget something, and sometimes that something is more important than at other times. I was about to call this a “critical error,” actually. A north wind had blown up, and it was not just buffeting the scope, it was making me feel badly chilled. Luckily, a little rummaging around in the back of the 4Runner turned up my emergency jacket. It is a thin nylon job from the freaking Wally-World, but it was quite a bit better than nothing. I also had some chemical hand warmer packs I’d snagged at Academy Sporting Goods that afternoon (I stock up every winter, since last year’s unused packs will have lost a lot of their oomph). Though I was now a little warmer, I began to wonder if I shouldn't just pack up the scope and head back to Chaos Manor South. The wind was worse than ever, and would obviously blow the scope around, which would be a big problem at f/20 and f/30. Hope springs eternal in Unk, as ya’ll know. Maybe the wind would lie down at full dark? I was already set up so I figgered I might as well give it a go. I pressed on, doing a 2-star goto alignment, four calibration stars, and an AllStar polar alignment. Only bummers? I used Formalhaut for the AllStar star despite it having been one of the goto alignment stars. I wasn’t sure whether that would cause some kind of problem or not, but there really wasn’t a prominent star in the south to use for AllStar other than Fomalhaut. That was not the real problem, though; the real problem was the stars were twinkling like mad. The seeing was even worse than it had been last time. One look at Rigel shimmering and waving like a little flag in my eyepiece disabused me of the notion of doing any spectroscopy. I reckoned Jupiter would be a wash, too. And I was pretty sure my 3x Barlow would stay in the accessory (tackle) box, even for the Moon. One good thing, though? The mount had no problem executing a goto to Rigel. Apparently it is OK, or at least not fatal, to use one of the goto alignment stars for an AllStar polar alignment. Not only were gotos fine all evening, the quality of the tracking indicated polar alignment was purty dern close. I didn’t notice any declination drift to speak of, not even with a Barlow and a small-chip camera. No spectroscopy. No Jupiter. Good ol’ Luna was the only game in town, so and Celeste went there and got started. Fired up my favorite image acquisition program, the wonderful (and, amazingly, free) Firecapture, and got to work. With the Moon on the laptop screen, it was obvious the seeing was even worse than I feared it would be. I also decided, much as I love it, that having Motofocus wasn’t that big a deal. I suppose I’ve got used to focusing the Edge 800 by hand in the eight months I’ve had her. Even so, it was nice to give good, old Celeste a little time under the stars again. 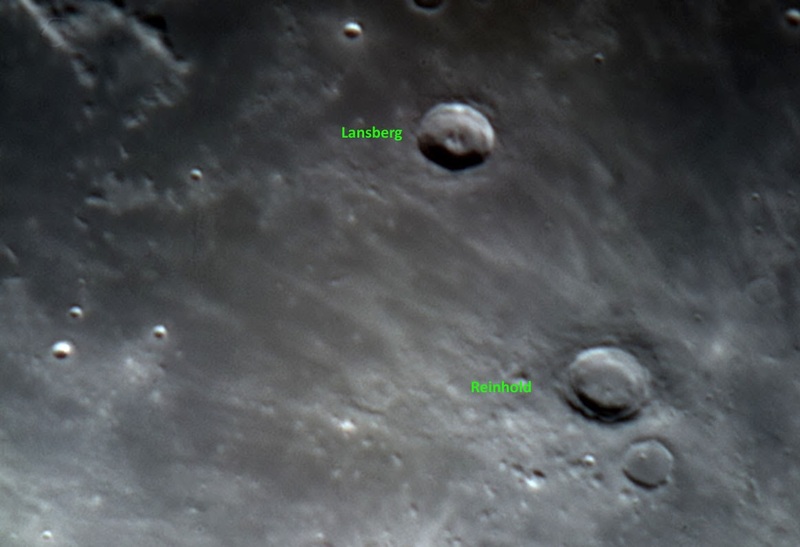 First up was a pretty crater pair, Lansberg and Reinhold, two nice, fresh-looking formations that lie southwest of spectacular Copernicus. Reinhold is about 210 kilometers from Copernicus and lies within the main body of the big crater’s rays. Despite its rather fresh appearance, Reinhold dates from the Eratosthenian period, 1.1 – 3.3 billion years ago in contrast to Copernicus’ age of 1 billion years or younger. While not as large as its famous neighbor, Reinhold is big enough, 48 kilometers, to catch an observer’s eye. The crater’s most prominent feature is its steep terraced walls. The floor is not quite smooth, and even on this night of poor seeing, I could make out a small peak near but not at the center of the crater, and other rough details. Also interesting is the near ghost crater, Reinhold B, 45 km to the northeast. Lansberg, 160 km from the center of Reinhold, looks fresher to me than Reinhold, but it is actually older, dating from the Upper Imbrian period 3.3 – 3.1 billion years ago. It is slightly smaller than Reinhold, 40 km across, and also features steep and terraced walls. One big difference is Lansberg’s complex double central peak. There are several small craterlets within the walls, but I couldn’t resolve any of them on this night. 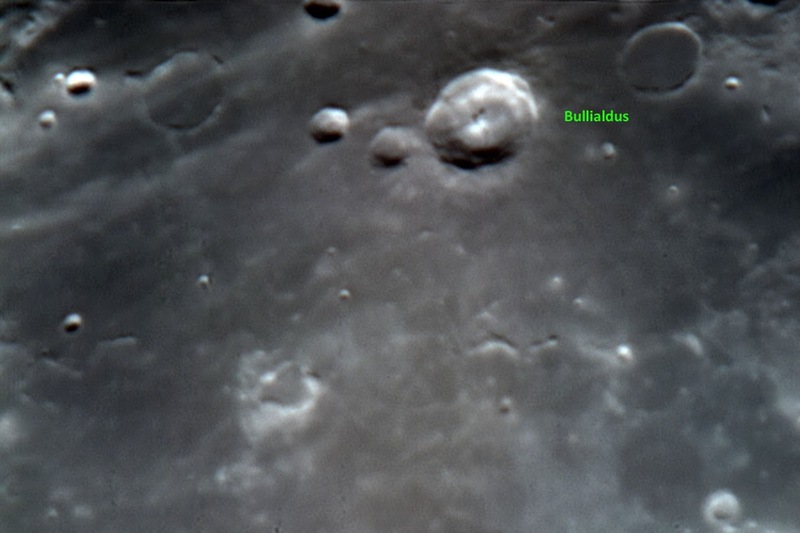 Next up was Bullialdus, a beautiful sight near the shores of Mare Nubium. Even in the punk seeing, I could tell its walls are sharp and terraced and that the central peak is prominent and complicated looking. That was about all I could see of this formation as it fuzzed in and out, however. Like Reinhold, it is from the Eratosthenian period. To the south, Bullialdus A and B are nice looking, if flatter and less well defined than the main crater, with A being almost a ghost crater. Hainzel is one weird looking thing at first glance. We know the mechanics of asteroid impacts dictate craters must be round, not oval, but Hainzel definitely looks strongly elongated. In part, that is due to perspective, as we are nearing the Moon’s limb here. 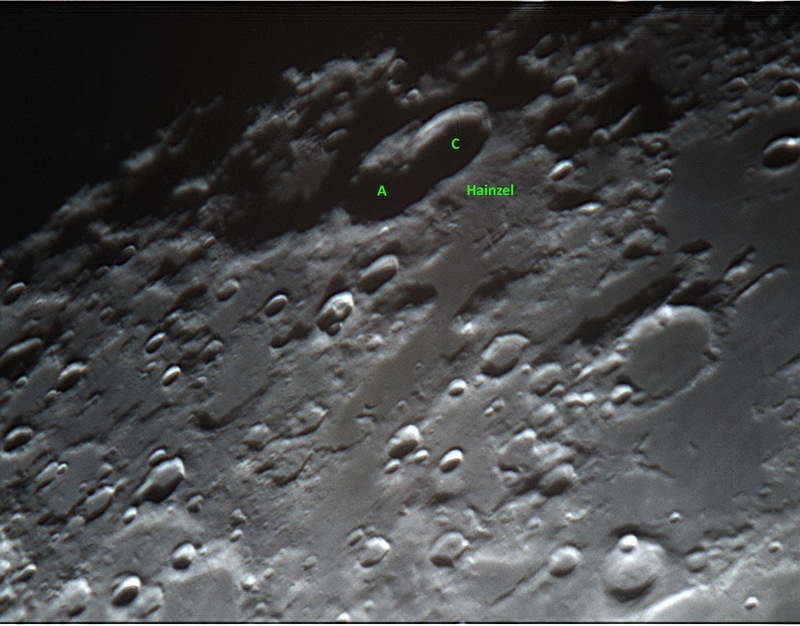 Mostly, though, it is because Hainzel is not one crater but two, A and C, with C (on the right in my picture) being better defined. It was a little early in the lunar morning to be imaging Hainzel, since its floor was still in darkness, but at least the seeing steadied down enough to allow me to get a halfway decent shot. I could even see terracing on the walls of C that were lit by the rising Sun. 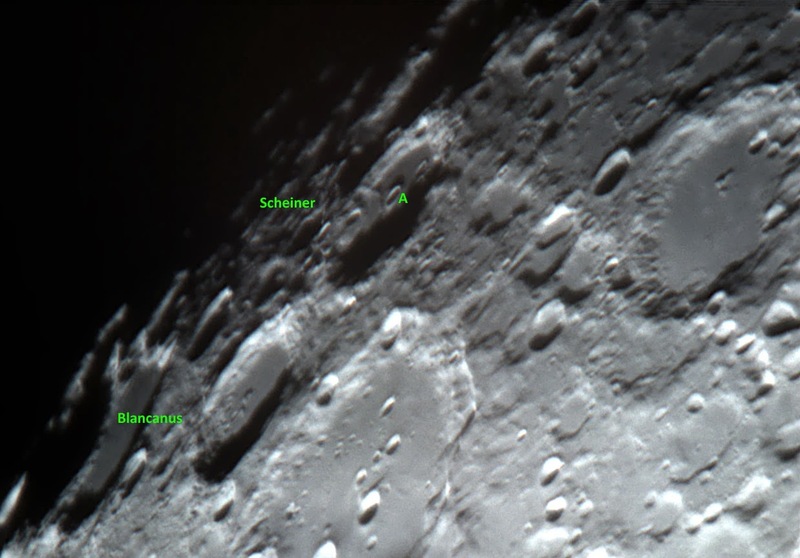 Blancanus and Scheiner are two big craters lying near magnificent Clavius, so it seems strange they aren’t talked about more and observed more. Blancanus, 106 km in diameter, is an older formation from the Nectarian period of nearly 4 billion years ago, but it doesn’t look overly aged. It has high terraced walls surrounding a smooth floor—at least the western part of its floor is fairly smooth. The eastern area has a tumble-down appearance due to an off center mountain and numerous craterlets. Immediately west of Blancanus is Scheiner. This big, 111km formation is even older than Blancanus, having been created in the Moon’s pre-Nectarian age as much as 4.55 billion years ago. What does it look like? To me it’s much like a slightly smaller Clavius, complete with large craterlets on its floor, the most prominent being Scheiner A, which is 12 km in size. Under flatter lighting, the western half of Scheiner has a worn appearance, but on this evening, the western rim looked as well defined as the eastern. 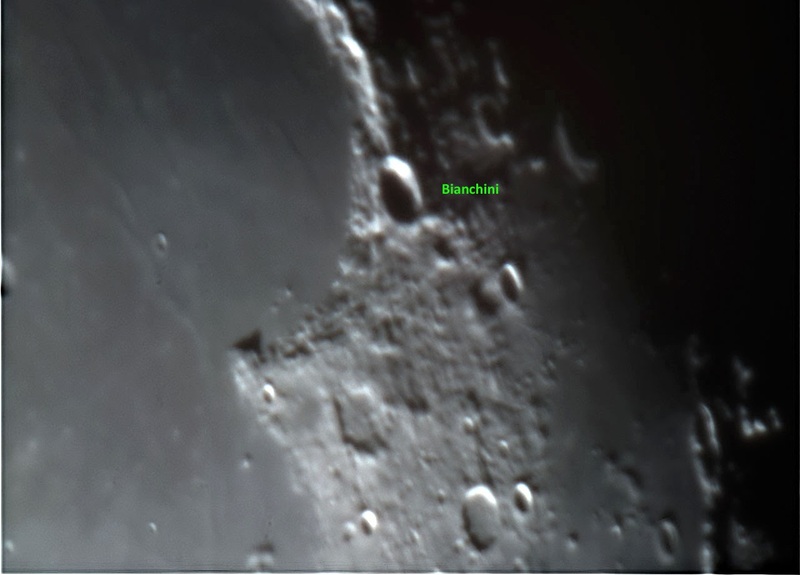 Bianchini, perched right on the shore/rim of beautiful Sinus Iridium, is one I will definitely revisit soon. It was dramatic looking on this night, a pot of shadows balanced on the edge of the Bay of Rainbows, but because of the low Sun angle I couldn’t see any of the this 38 km diameter crater’s floor detail, which includes a prominent craterlet, “W.” Bianchini is from the Upper Imbrian period like Lansberg. Given the blurry images I was seeing on the screen, I began to think I was wasting my time trying to image even the Moon. 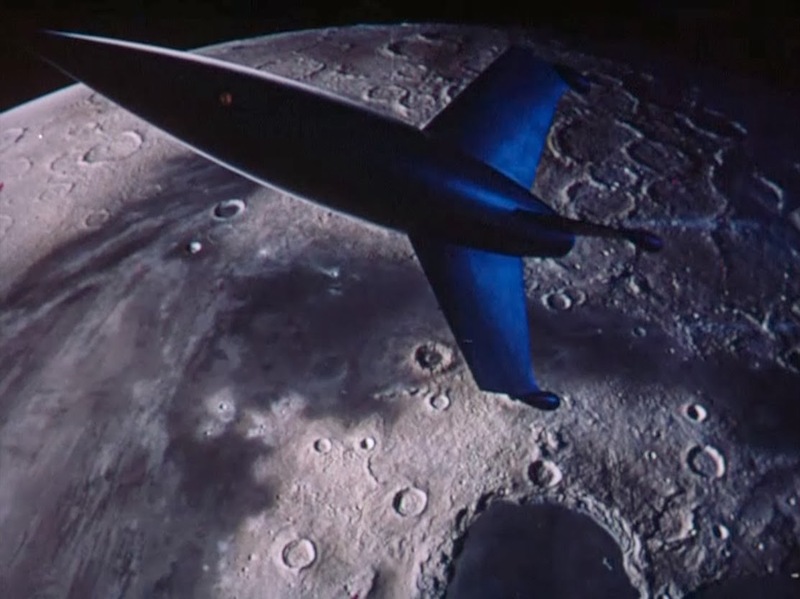 So, when I finished Bianchini I called a halt to Night 4 of the Destination Moon Project. Still, it was way, way early, just past 7 p.m., and despite the wind, I was warm enough for the moment. A look over to the east showed Jupe blazing his heart out. Well why not? I didn’t expect much, but I’ve gotten some acceptable shots on nights I thought were a total loss thanks to the magic of Registax. How did Jupiter look on the Firecapture display at f/20? Not so hotsky, y’all. Sure, I could make out cloud bands, but that was it. With the ZWO’s high frame rate, well over 30 frames per second at its maximum resolution of 1280 x 960, I’d expected to see a little more detail than just some straight-looking bands despite the poor conditions. Whatever. I fired off several sequences. And that was it. It was still early, but I was now genuinely chilled and the wind had not let up a bit. I slewed back to the Moon one last time just in case, but the images on the computer looked no better. Big Switch time, then. Which sure is easy when all you’ve got on the field is a C8 and a computer. I am also happy with my current observing table setup: I don’t have an observing table. 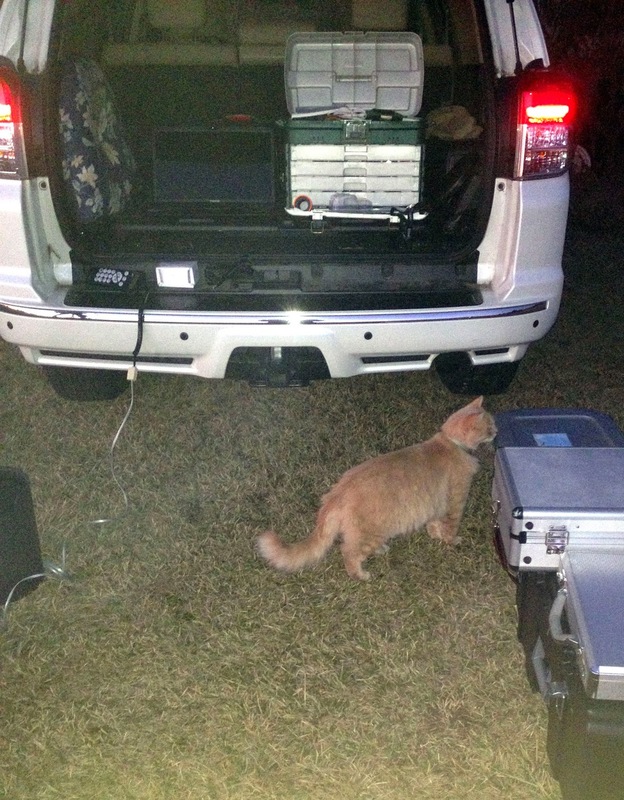 I set up the PC and the tackle box in Miss Van Pelt’s rear (ahem). She is well equipped for such things, featuring both AC and DC outlets and various lights in her cargo area. Her open tailgate acts like a roof and keeps me a little drier from dew than I’d be if I were standing out in the open. Back at the Old Manse, I was unloaded and ensconced in the cozy den with the omnipresent Yell bottle at my side just in time for Svengoolie’s show. On this night, he was rolling one of the silliest, strangest, and most loveable 1950s Sci-Fi epics (Or is that “URPics”?) of all time, The Monolith Monsters. The film features what must be the strangest space “monsters” of all time. I won’t even try to describe this picture for you; it much be seen to be believed. Sure, it’s a “B,” but it is an intelligent B. and is different if nothing else. Have a look. By the time the monolith monsters were defeated by the Valiant Scientist, it was getting on to midnight, and a little too late to do any playing with the sequences I’d shot. Not only have I learned it’s best not to fiddle with your astro images the night you shoot them, I didn’t have much in the way of hopes for these, anyway. The next morning, though, I broke out the laptop to see what I could make of the .avi files. The program I’d be using to stack and process their frames would be the latest edition of Registax, Registax 6. These days, there are alternative stacking programs like Autostakkert, but in my opinion, Registax is still the best, and nothing anywhere beats its amazing wavelet filters for sharpening and bringing out details in your images. Of course, there is a limit to what even Registax can do with poor source material, and the .avi sequences I’d captured were anything but good, as I could see viewing their fuzzy frames. The Jupiter sequences were absolutely horrible, and immediately went into the recycle bin. And that is true. Compared to the fuzzy full-disk images I took as a sprout even these misbegotten frames are a revelation. That said, muchachos, I’ll probably be back at the same point in the lunar cycle next month for a redo if the weather gods deem that allowable. I reckon the crystal-clear wavelet-processed Moon pictures Registax can turn out on a decent night have spoiled me and it’s hard to settle for less anymore. As I was finishing this entry, I got word that one of our giants, John Dobson, had died on the morning of 15 January. Wherever you are, raise a toast to the man, a visionary and iconoclast, who changed our avocation so much. You can bet I did. I am not a huge fan of Dobsonian scopes, but I am a huge fan of the man. 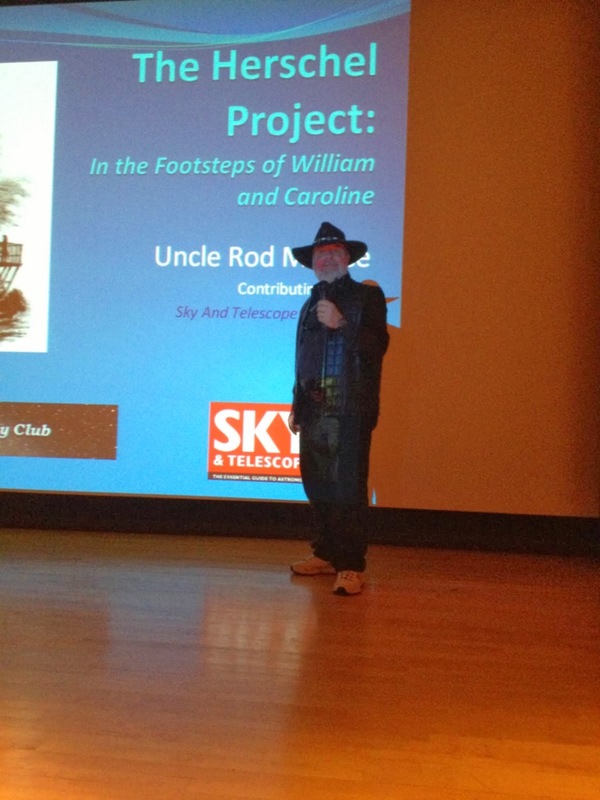 I was pleased to hear the San Francisco Sidewalk Astronomers are dedicating this year’s ISAN (International Sidewalk Astronomy Night) to John’s memory, and rightly so. He practically invented sidewalk astronomy, which in his mind was probably a greater achievement than the popularizing of the friendly alt-azimuth scopes that bear his name. If nothing else, muchachos, last Friday night’s expedition to the Possum Swamp Astronomical Society dark site proved two things. First, that Unk is practicing what he preaches. Second, that my little ZWO camera really does seem to be a jack-of-all-trades. Is there anything the inexpensive ASI120MC can’t do? Let us begin with Thing One. If you’ve been reading the Little Old Blog from Chaos Manor South for long, you will recall my dark site expeditions have usually been on Saturday nights. In the past, that was because of my heavy work schedule. Saturday was the only evening where I could be sure I wouldn’t be too dog-tired to lug all the gear out to the dark site. Friday dawned, as predicted, clear and cold. Miss Dorothy and I had a little running around to do, including picking up Unk’s new glasses. 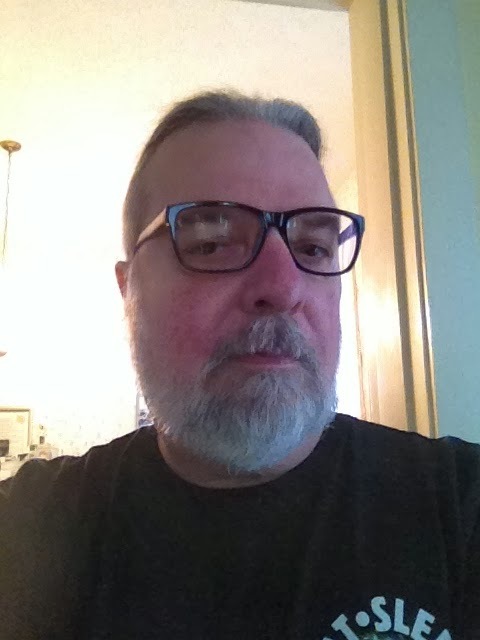 Yep, after years of denial, Unk had to admit the time had come for him to start wearing glasses full time. On my first visit to an eye doc in my life, I learned I now had considerable astigmatism. Hearing that, I wondered whether that’s what had made visual observing seem not as good as it used to be the last five years or so. We will see. In the course of picking up Unk’s specs, visiting Waffle House (cheesy eggs, raisin toast, grits, bacon), and doing a couple of errands, Unk’s resolve about Friday night began to falter. If it was in the dadgummed 40s at noon, what would it be like after sundown? And there were some clouds, mares’ tails, scudding across the sky in advance of Saturday’s front. Maybe it was shaping up as more of a Rebel Yell and cable TV night than a dark site evening? Nope. At three p.m. the clouds had left. No excuses. Load up the Toyota and get ready to go. With it as chilly as it was, dipping into the low 40s as the Sun began to sink, I was happy the loadout for Miss Van Pelt, the 4Runner, was relatively light: Edge 800 C8, VX mount and tripod, camera case, one big gear box, Toshiba laptop, small case of 1.25-inch eyepieces, three jump start batteries and that was purty much it. What was in the camera case? My ZWO planet cam. Despite Jupiter being high in the sky reasonably early, and a pretty, if slim, crescent Moon in the west, I didn't plan to shoot any Solar System objects on this run. Nope, I was out to do spectroscopy with the ZWO and a new (to me, anyhow) computer program RSpec. Spectroscopy is not something I’ve talked about much—if at all—here, but it is something Unk has been interested in for a long time. I’ve taught spectral classification, figuring out the types and compositions of stars from their absorption spectra, and spectrometry for years and years, but I’d never taken a spectrogram (an image of a spectrum) with my own camera and my own telescope, though I used to dream of doing that as a sprout. 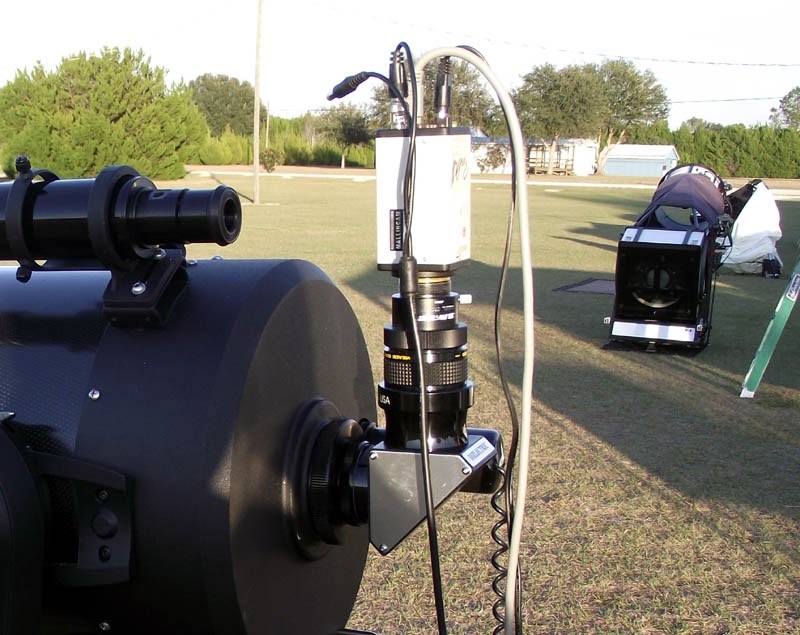 Way back in the vaunted day, in the 1960s, Edmund Scientific sold a stellar spectroscope, a widget you inserted into your focuser, which would let you see the spectra of stars. Presumably with enough resolution on bright stars to let you make out their absorption lines, the dark lines that represent the elements in the stellar atmosphere. How well did the Edmund work? I have no earthly idea. I was fascinated by the idea that you could use the thing to figure out what stars were made of, but at a price of $42.50 (at least 250 bucks in today’s small dollars), I sure couldn’t pay the fare to find out, nor could any of my mates in our Backyard Astronomy Society. There things stood till a few months ago when I got an email from Tom Field. His name was familiar to me as one of the folks leading the charge in the spectroscopy area of the “scientific contribution” side of amateur astronomy. 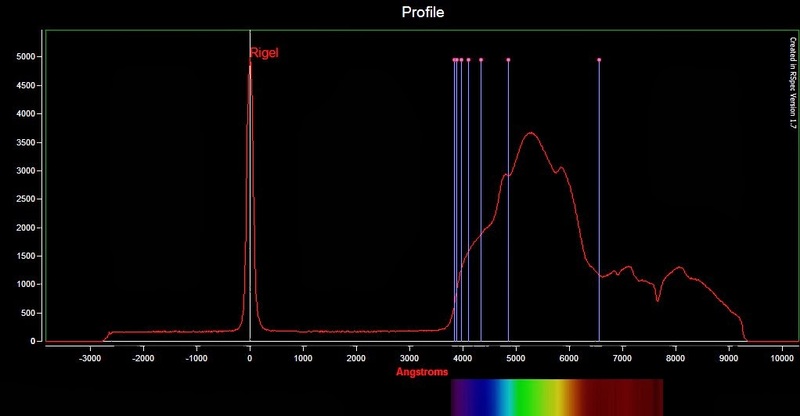 Tom offered to let me try his program RSpec and a diffraction grating (used to produce spectra with your camera), a 100mm grating called the Star Analyser SA-100. I was a little skeptical about my ability to make it all work, but Tom insisted I could, so I said “yes,” though I had my doubts. Naturally, we had unrelievedly cloudy skies for months after I got RSpec. I was able to play with it indoors thanks to a picture of Vega and its spectrum Tom sent me, and I was encouraged. The program installed easily, was professional looking, and seemed completely bug-free. I could produce a spectrum (in the form of an X-Y graph as per normal for electronic imagers in these latter days) from the image of Vega without much hassle. I still wasn’t sure about making it go in the field, however. Before I could think about doing that, I needed to pick a camera to use with the grating and RSpec. What I had on hand was an SBIG ST2000 CCD, a Mallincam Xtreme, a Canon DSLR, the ZWO, and my old Meade DSI. Tom suggested the Mallincam might be a good place to start, but I demurred. That would mean I’d have to involve a frame grabber and software to convert the Xtreme’s composite video to digital form. As for the still CCDs and the DSLR? I thought any of them might be a bit of a handful for this application. Well, what about that new ZWO? People were using them for everything from the Moon and planets, to hydrogen alpha imaging of the Sun, to deep sky imaging. Why wouldn’t it work as a spectrograph? It appeared it would work with RSpec--the program recognized the camera/driver, at least. As soon as I plugged the camera into the PC, RSpec’s video module picked it up, began displaying its video, and indicated it was ready to record. I got out under the stars shortly thereafter, and was again encouraged to believe RSpec and the ZWO would be a great combo. Only fly in that there ointment was that clouds intervened before I could really get everything sorted out and start taking spectra. And so, back to last Friday night. All loaded up, off we went. As me and Miss Van Pelt navigated past the shopping malls, I was reminded why Saturday night is a better choice than Friday this time of year. I needed to set out by 4 p.m. to get to the site before sundown, and the Friday after-work traffic was just freaking nuts by then, with my normal 45-minute trip to the dark site taking well over an hour. On the way west, the cloud patches I was seeing began to concern me, but the closer I got to the private airfield we use for observing, the clearer it got. The sky was almost 100% cloud-free when I pulled onto the field, which was a good thing for observing, if not such a good thing for comfort. I glanced down at the temperature display on the dashboard of the truck. 39F already and the Sun wasn’t even down yet. When I got out, it became abundantly clear this was not a night for slowly layering on clothing. I grabbed my big red coat, the one that helped me survive Bath, Maine one cold winter, put it on, and zipped it up. As I was setting up, I was all by myself except for the airstrip’s mascot, a great big yellow tomcat. I wasn’t overly surprised. It would be below freezing shortly, which is awful cold for us Southrons. Quite a few of my PSAS buddies were still doing holiday trips and recovering from New Year’s Eve, too. The saving grace temperature-wise? Absolutely no wind. Not at ground level, anyhow. The upper atmosphere (and thus the seeing) was a different story, as Unk was to find out before long. Got Mrs. Peel, the C8, on the VX. Not much to report there. Given the cold and the weather forecast, which called for clouds before midnight, I didn't think I’d make it much beyond ten or eleven o’clock, and so didn't go to the trouble of setting up NexRemote. One thing I did do was connect the NexStar Plus hand control to the mount via an extension cable. Why Celestron makes its current hand control cords so fraking short I have no idea. But take it from moi, they are short enough to be nearly unusable. I’d had some errors (No Response 16 and 17) the last time I’d used the extension, so I’d given its contacts a good cleaning with alcohol before I’d left home. Aside from a momentary glitch at start-up, the extension worked well, and it sure was nice to have the HC right at the computer. As for the scope itself, the setup on the rear cell was the same as what I use for lunar imaging: Meade flip mirror screwed onto the rear port, Meade 12mm reticle eyepiece in its focuser, and the ZWO in the camera port. The only difference this time was that the camera went directly into the flip mirror without a Barlow. I figgered a smidge over 2000mm would be enough focal length. Why did I use the flip mirror? The ZWO’s chip is small, 1/3-inch, and even without a Barlow and with accurate go-to, I thought the flipper would make object finding a lot easier. With the flip mirror in place, I flip the mirror down, center the target in its eyepiece, flip the mirror up, and it is in the field of the camera. In addition, the flip mirror is set so what’s in focus in its eyepiece is in focus in the camera, with maybe just a little fine-tuning required. Mrs. Peel was goto aligned and polar aligned without much fuss. Ran the six stars of the normal go-to alignment procedure, and then did an AllStar polar alignment using Fomalhaut. While there was not too much fuss, there was some, as there always is with your silly old Uncle. Jon had forgot one of his batteries, so I gave him one of my jumpstarters. I’d run the scope and dew heaters off a single battery with a cigarette lighter splitter. That would have worked fine, but I was too cold to feel like rummaging around in the case for my good splitter, and used one that doesn't make very good contact. Naturally, just after I finished the alignment, I bumped it, causing a momentary power loss and the loss of my alignment. Turned out that was not such a big thing. I’d had to move the mount a fair distance in altitude and azimuth to do the polar alignment, and my gotos were a little off as a consequence. In the field of the 12mm eyepiece, but at the edge. After I redid the alignment following the power glitch, my targets began falling near the center of the eyepiece at 160x. Alright, time to get to work. Tom suggests starting with Vega or another bright A-type star when you are new to RSpec. The hydrogen beta line used to calibrate RSpec is strong and obvious in A stars. Alas, Vega was now within 10-degrees of the horizon, and given the seeing—even higher stars were twinkling like mad—was a no-go. What then? Rigel was perfectly placed in the east. He’s not an A, he’s a B, and the Balmer lines are weaker in his spectrum, but I reckoned he would do. It was far too cold to make me want to play with the spectrum out on the field, though, so I would record it for later processing. One thing was obvious without processing of any kind; the graph was showing plenty of the dips that represent absorption lines. It was clear the simple rig was picking up a fair amount of detail in Rigel’s spectrum. Before mashing the record button, I centered the star a little better on the program’s video display and placed it within the two movable bars that are used to bin the image for the best image scale. 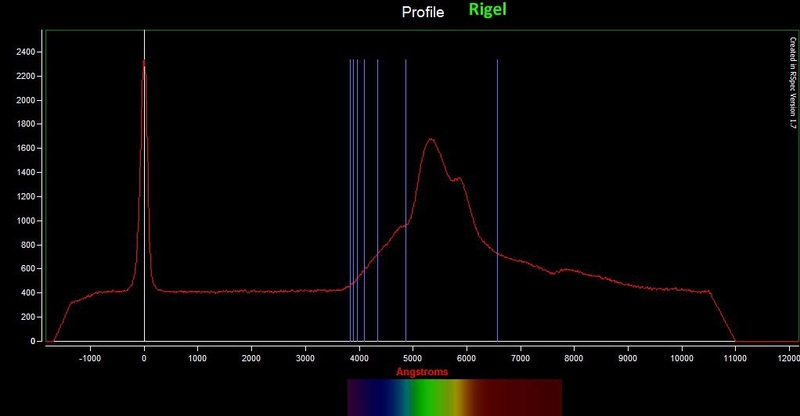 I also rotated Rigel and its rainbow using the tool provided in RSpec till the star was on the left and the spectra on the right (the traditional way of doing things) and I was set to record. Actually, I didn't have to rotate the star and spectra. The program only records the raw video coming out of the camera, but I wanted to be sure Rigel was in a good spot in the frame so I could adjust its position correctly during processing of the recording later. I fired off about 15-seconds of video of Rigel, took another sequence as insurance, and began pondering what else to shoot. Alnitak was nearby, and while it’s even hotter than Rigel and has even less prominent Balmer lines, I went for it anyway. I followed up with a cooler star, Capella, since it was bright and nearby, and finally got an A star with Sirius, a natural, though he was hopping around like crazy in the poor seeing. I figgered that ought to be enough to start with, but I wasn’t sure how good my exposures were. Focus was OK given the seeing, and the little stripes of star spectra looked sharp enough, but I wasn’t sure if I was exposing them properly. I did note that the graph of the star’s spectrum was moving around a lot due to seeing, but I hoped RSpec’s image-averaging feature would fix that. What then? It was now truly, no fooling, honest-to-god c-o-l-d. I’d chugged about half a Monster Energy Drink earlier, and had set it aside while I was doing my spectroscopy. I went back to it now and was not exactly surprised to find what was in the can was a Monster slushy. Chaos Manor South’s warm den was sounding better and better, but it was early, and I really wasn’t uncomfortable. I wouldn’t have been uncomfortable at all if I’d a-had the good sense to rustle up a pack of chemical hand warmers and put on my thermal socks before I left the Old Manse. But I didn't, and my hands as well as my feet were turning into Achilles’ heels (I had a nice fuzzy watch-cap on my noggin). Jon was finished with his picture taking, and like me, he wasn’t quite ready to go, so we spent a half hour or so doing relaxing visual astronomy. What did I look at (with the humble 20mm and 15mm Orion Expanse eyepieces I’d brought along)? M1, M37, M35, M42, and a few other purties. Mostly, though, I got in my yearly eyeballing of my old friend Uranus, the mysterious Seventh Planet. I also hit his buddy Neptune while I was at it. In truth, they were not much; the seeing was not good enough to support magnifications higher than about 150x, so they were both barely resolved. Still, I’d paid my yearly call on these distant worlds. Shortly thereafter, Jon and I became aware of several things: the sky was beginning to degrade as Saturday’s front began to push in, ice was forming on our equipment cases and scopes, and our feet were danged cold. Time to load up and skedaddle. Which was easy enough since I’d packed up camera and laptop once I’d got the last of my spectral data. Back at home at Chaos Manor South with the gear unloaded, I was purty happy to be out of the cold and sipping “sarsaparilla.” I was also momentarily put out. The dadburned cable channel, ME TV, didn't have Svengoolie on. I had been looking forward to watching King Kong Escapes. Then I realized it was Friday, not Saturday. One of the hazards of being retired is you tend to lose track of which day it is, campers. Come Saturday morning I was ready to start on what I figgered would be the real work of spectrometry with RSpec, processing the sequences I’d taken. First up was instructions. RSpec really doesn't have any yet. Mr. Field has written instructions on his to-do list, but tells Unk that thus far he’s been too busy getting the program working as well as possible to put together a manual. In lieu of that, there is a series of excellent instructional videos on the web you can access from within the program. That is cool enough, I reckon, but your old-fashioned Unk likes the “what to dos” set out in black and white in writing. I watched the videos and made up my own shorthand list of instructions on how to calibrate spectra. Once the program is running, you open your chosen video, and rotate the image with the slider control as mentioned previously till the star is on the left and the spectrum on the right. If the graph isn't moving around too much, you can just pause it, scroll through it to pick out a particularly nice frame with another slider, and proceed to calibration. If it is jumping around due to seeing, you want to click the “average” box to steady it down a bit before beginning calibration. Calibration is the heart of your task. You've got a spectrogram of your star, a graph showing dips that represent absorption lines. However, the X axis of the graph is in pixels, not angstroms, and is useless for figuring out which lines are which, which represent what elements. You fix that by calibrating your spectrogram, changing those pixels to angstroms. Despite my fears, calibration turned out to be fairly easy. Step one is to open the calibration window, natch. You then click on the peak of the star’s image, the big spike on the graph on its extreme left. Next, and a little trickier, you have to click on the low point of the dip of the hydrogen beta line on the graph. That in itself is not difficult—if your star shows a prominent dip at the h beta wavelength. While Rigel didn't show as prominent a line as Vega would have, it wasn’t too hard to pick out the “line.” I looked at the spectrogram from Sirius, but its h-beta wasn’t any more prominent. How do you know what’s the h beta dip? It should be the first big valley to the left of the spectrum’s peak. Calibration done, click “apply” to get to the moment of truth. To find out if you did good nor not, you click the “elements” button in the toolbar up top (three vertical lines). In the window that appears, click “Hydrogen Balmer series.” That makes vertical lines representing the good old Balmer lines appear overlaid on your spectrogram (the graph). Does the hydrogen beta line (you can run your mouse over the lines to identify them) pass through the dip you identified as the hydrogen beta line on the graph? Do the other Balmer Series lines coincide with dips on the graph? If so, you are in like Flynn. My results? Purty good. Maybe not perfect, but purty good, though some of my dips didn't quite line up perfectly with the superimposed lines. I suspect that was mostly due to me not quite getting my mouse on the lowest portion of the hydrogen beta dip. Seeing may also have had some effect. And so might have exposure. What do you do next? Once you’re calibrated, you can go on to identify the other lines in your spectrogram. RSpec provides libraries of professional spectra for comparison purposes as well as a library of elements (the vertical overlaid lines) in addition to the Balmer Series. Your finished spectra, which RSpec calls “Profiles” can be saved, exported, and printed. For me, though, what’s next is another spectrographic run, one done under steadier seeing I hope, now that I am more confident with the program and with using ZWO as a spectrograph. One thing I’ll probably work on is exposure, since I think some of my spectra were underexposed. Nevertheless, to say I was thrilled with my results with this incredible program would be an understatement, muchachos. I was frankly dumbfounded by how well and easily RSpec worked. I was finally decoding the fingerprints of the stars as I’d dreamed of doing as a sprout all those long years ago. Happy 2014 from Chaos Manor South! Believe it or no, muchachos, and I am having a hard time believing it myself, 2014 marks my 50th year as an amateur astronomer. I haven’t had any huge epiphanies about that, not yet. Maybe I will, and I will let you know if’n I do. For now, though, I’ll stick to one of the Little Old Blog from Chaos Manor South’s traditions, my Year in Review, a recount of Unk’s triumphs and also his follies and foibles from the year just past. Before we get into that, I know you-all want to hear me recite my litany of WHAT I GOT, what of an astronomical nature was under Chaos Manor South’s slightly downsized tree (with the kids gone, I am pretty much done with 11-foot Xmas trees) this year. Oh, the haul was good, y'all. 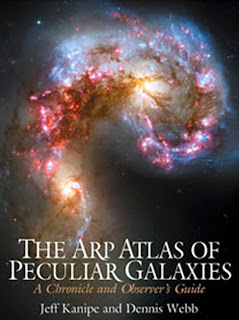 First and foremost, maybe, was Jeff Kanipe Dennis and Webb’s The Arp Atlas of Peculiar Galaxies, which I mentioned last time. The book begins with an account of Arp’s career that is very well written and interesting even if, like your old Unk, you look askance at Halton Arp’s more outré ideas. It was also nice to have the reproduction of Arp's original Atlas. 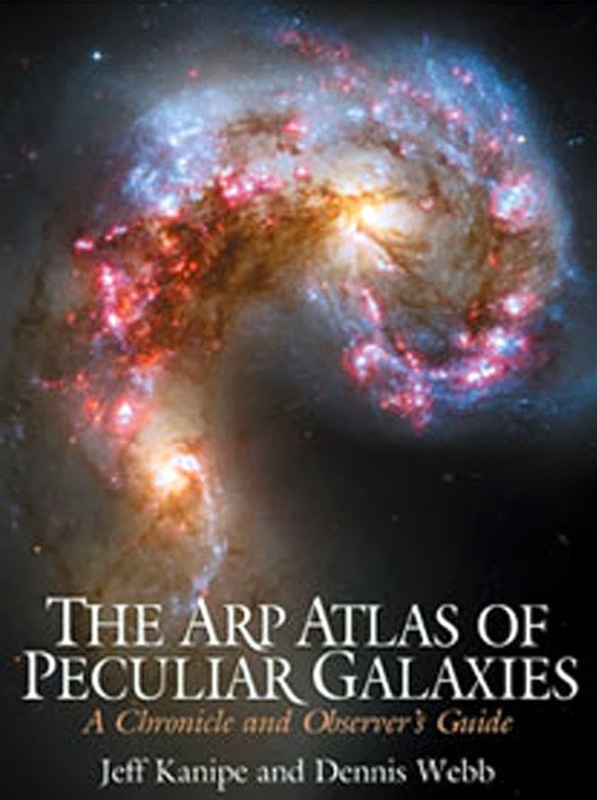 The winner, though, is Kanipe and Webb’s Arp observing guide. The guide, which forms the bulk of the book, is well illustrated with excellent amateur images, one per object. A small chart is also present for each Arp. Best of all, the notes given for each object tell you what you should be looking for and why the galaxy was a member of Arp’s odd menagerie. This is done briefly in a format well suited for use in the field. That is going to be neat, y’all, since I’ve often been left scratching the old noggin trying to figure out what makes a particular fuzzy “peculiar.” The book’s production values—paper and binding—are excellent, and I suspect it will be at my side constantly this spring. What else? As y’all know, I am a Canon man. Back in the film days, I used Nikons, but when the world went DSLR, I switched to Canon and haven’t looked back. My main camera over the last five years has been a little 450D DSLR. It’s been a real workhorse and has produced plenty of good celestial and terrestrial images. But I’ve been doing more images for publication to illustrate my magazine articles of late, and figured it was time for a modest upgrade of the photo gear. What Santa and Miss Dorothy placed under the tree was a Canon 60D, a member of Canon’s “prosumer” line. It is significantly more full-featured than the old 450D, has a higher resolution sensor, and can shoot video, HD video. Why didn't I spring for its new replacement, the 70D? I am a sucker for a bargain and B&H Photo, my go-to photography guys (they have a good selection of astro-stuff, too), had an incredible deal on 60D camera bodies. Only criticism thus far? It’s noticeably heavier than the 450D. So I got just a body? Nosir buddy. Accompanying the 60 was a 55 – 250mm Canon image stabilized lens. I originally put it on my list because I thought it would be perfect for imaging the GREAT COMET, Comet ISON, who was supposed to still be blazing right now. We know how that turned out (K-A-H-O-U-T-E-K), but I think I’ll be able to find plenty of celestial and terrestrial work for the new glass. Finally, there was one more piece of astro-gear, a totally unlooked for gift, Hotech’s refractor reducer and field flattener. I haven’t been able to even think about using it yet (it is pouring rain on the new Moon weekend when this is being written), but it is beautifully made and I can hardly wait to try it with Miss Dorothy’s new ES refractor. In other words, stay tuned. The highlight of January, as it has been for some years now, was our after-Christmas trip down to the Chiefland Astronomy Village. Despite the cloudy skies that can afflict the southland in the wintertime, we've had good luck with our New Year’s trips, almost always coming home with a passel of new deep sky objects in the bag. And so it was this past January. Two (fairly) good nights out of three. Arriving at the Days Inn, we kinda got off on the wrong foot, though. Dorothy and I were checked into a room that stank. Literally. We were quickly given a different one that was fine, but it appeared to me the slow decline of the motel, which began when it switched from Holiday Inn Express to Days Inn several years back, had sped up. What was the best thing that happened this trip? I got to spend time with fellow Chiefland Observers who I hadn’t seen in months. The skies were good, too. Not spectacular, but they were clear enough for me to corral 28 Arp galaxies/groups as part of my new “after the Herschels” observing project, Operation Arp. I also hit a bunch of spring Herschels I needed to reimage. In order to send the NexStar 11 to the Arps that don’t have NGC or IC numbers, and thus aren't in the NexStar object library, I had to get NexRemote's virtual port feature working again—I’d had a problem with it a while before and had sort of given up on it. Surprisingly, I got the virtual port going without much trouble—I’d expected to do hours of computer tinkering—and was able to effortlessly cruise to PGCs and other off-the-beaten-path sprites with a click of SkyTools 3. Otherwise, Unk was struggling with a couple of things this month. First was getting a couple of wisdom teeth pulled, which was a new and scary experience for your old Uncle. The good part was that it wasn’t as bad as I feared and the Mardi Gras king cake ice cream from Old Dutch made me feel a lot better. I was also facing the end of my engineering career and the beginning of early retirement, which was also mighty scary. On a happier note, I was thinking it was time to replace my time-honored combo of CG5 and C8 with a new “retirement” scope and mount, Celestron’s new VX and Edge 800 duo. Was mostly a month for reminiscing. Unk was very, very busy getting all his retirement ducks in a neat row and didn’t have a whole lotta time left for a whole lot else. I did get out to the dark site with the DSLR and got a few shots of Comet Panstarrs, though. This was supposed to be just the appetizer, just something to get us into a comet frame of mind for ISON. 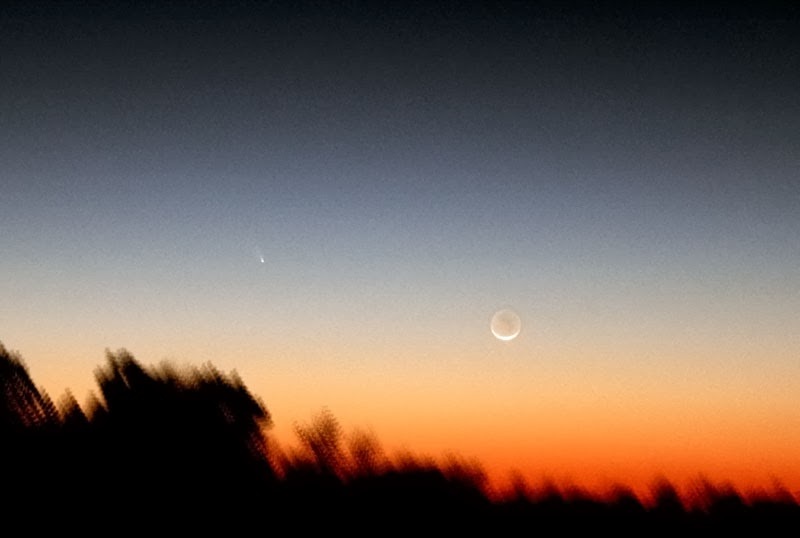 Panstarrs was not a bad little comet. He was a smidge close to the western horizon at dusk, but my observing buddy Max and I got some OK pictures and showed several excited guests the comet out at the dark site. Like a lot of folks, I used Panstarrs as a shakedown run for ISON. One thing I discovered? I’d want a longer lens for the Canon DSLR for comet time. 55mm (88mm equivalent for APS-C sensors) was not long enough. I put a zoom that would take me out to at least 300mm on my want list. 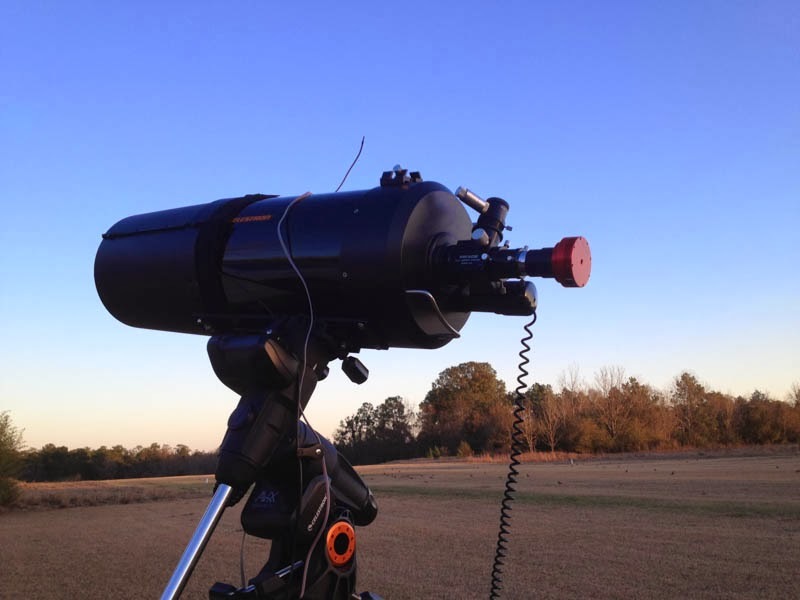 I also thought about investing in a camera tracker like the iOptron Sky Tracker for those ISON nights when I wanted to shoot long exposure but didn't want to drag out a big mount. Good thing I decided to wait on that till it was clearer what ISON would do. Thankfully, it was a happier story out on the CAV field. The first night was completely rained out, but night two was, if not a complete winner, quite passable. Got the NexStar 11, Big Bertha, set up and by the end of the evening had imaged (reimaged) 50 Herschels. Friday night hadn’t begun well, though. It hadn’t looked like we’d get anything at all, and I’d put the scope to bed at 10 p.m. As I was headed back to the motel, howsomeever, I saw the clouds were breaking and, prompted by a couple of “friends” who it seemed were in the 4Runner with me, turned around and made tracks back to the CAV. Night Three, Saturday night, was at least as good, with me bagging another 60 aitches that needed their portraits taken again. What was wonderful about Saturday, though, was the picnic in “Spring Picnic.” It’s no secret there’s been tension between the observers who frequent the Billy Dodd Field and those who use the “New Field.” That was gone for the picnic, with both groups coming together for food and fun. Was a landmark month for a couple of reasons. One of which was that a new C8, a C8 of a new type, came to live at Chaos Manor South. Unk had indeed treated himself to a modest Retirement Scope, a Celestron Edge 800 on the CG5’s successor, the Advanced VX German equatorial mount. The month was also notable because I had a great time at a star party that was new to me. Sort of. 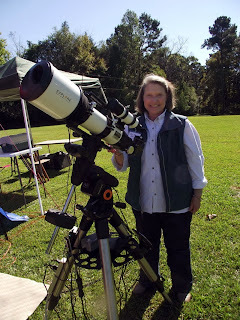 If you are a faithful reader of the Little Old Blog from Chaos Manor South, you can’t help but have heard me speak of our “home” star party, The Deep South Regional Star Gaze, which is held every October or November in the wilds of Louisiana at the Feliciana Retreat Center. For some years there have actually been two star parties held there, the second one being the Deep South Spring Scrimmage. In the past, work prevented me from attending, but that would not be a factor this May. I had a great time at the 2013 Scrimmage e’en though the weather didn't cooperate until the last evening of the three-night shindig. When it did, I was ready to take advantage of it, and my beautiful new telescope, who I’d dubbed “Mrs. Emma Peel,” rocked, scoring nearly 100 faint fuzzies. The big hero of the Spring Scrimmage, though, was the old CG5 mount. 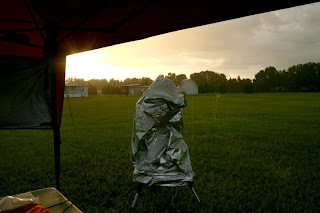 Despite being going on nine years old, this “budget” GEM didn't miss a beat, delivering deep sky object after deep sky object to the Edge 800’s field with the help of NexRemote. I was a little put out I didn't have the new VX mount in time for the star party, but it was nice to give the CG5 one last big night under the stars. The other major May event was my trip up to Raleigh, North Carolina to do a presentation for the justly famous Raleigh Astronomy Club. Despite an, as usual, punishing flight up, I had a wonderful time. The RAC folks sure treated me right, and I was finally able to meet Phyllis Lang, author of one of my most used astro-softwares, Deep Sky Planner, in person. Again, there were two notable things about the month. I got a good VX (after having first received a problematical one), and I went back to the Moon. My original VX had a bolt-hole that was not properly threaded. That doesn't sound like a big deal, but, unfortunately, it was the hole for the bolt that holds the mount head to the tripod, which made it a critical error as we used to say in the missile game. The replacement, which I got quickly, was perfect. From the beginning, it was obvious the VX is an improvement over the CG5. I DIDN'T like the new Celestron Plus hand control, but that was the only thing I found to complain about. Back in the heady days of the webcam revolution, ‘round about 2003, I spent a lot of time on Luna. But purty soon I was getting into deep sky video and forgot about the Solar System for a spell. If I’d wanted to revisit the Moon with a camera, I’d have felt funny about using my lowly SAC7B modified webcam for that, anyway. Everybody knew that in 2013 you were supposed to be using a Flea, an Imaging Source, or some other fancy (and expensive) planetary camera. But in June I heard about a new planet-cam, the ZWO, which was outdoing the more expensive spreads, was being used by masters like Chris Go and Damian Peach, and which was less than 300 bucks (for the color version I favored). I was blown away by the lunar images I got on the first night out with the ZWO ASI120MC, and have been spending a lot of time re-exploring the Moon since. I even inaugurated a new observing project, “Destination Moon,” a quest to image the 300 most prominent lunar features. Which turned out to be a good idea, since the weather last summer and fall sure didn't encourage deep sky work. In addition to bringing a real milestone, Unk’s 60th freaking birthday, July also saw our annual summer trip to the CAV. I was hoping for a good one. In July of 2012, I’d had a nice time, but had struggled with clouds and was lonely without Miss Dorothy, who had gone to visit daughter Beth in DC that July. This July would be different. D. would be by my side, and I was retired so I could wait out bad weather for days down at Chiefland if’n I wanted. Unfortunately, except for having the wonderful Dorothy at my side, none of it quite worked out. I was loaded for bear, or at least Arp galaxies, with my VX, Edge 800, and Mallincam Xtreme, but my total observing time Down Chiefland Way amounted to about 30-minutes. Thursday was cloudy and rainy, Friday was worse, and Saturday wasn’t much better. We thought about doing an extra day or three, but the weather forecasts indicated we’d just be wasting our time. The high point of the trip was probably our stay at the Chiefland Best Western. It is an older motel and certainly not fancy, but was a definite step up from the pea-picking Days Inn. Most of all, it was a relief. I had been concerned I might have to think “tent,” or “popup camper” or “trailer” if the Best Western didn't pan out, but it is fine and I hope that unlike the Days Inn it will remain fine. The clouds that arrived in May didn't show any signs of leaving in August, and Unk got very little astronomy accomplished over this long, damp, sultry month. Me and D. did have a nice trip to the Alabama Space and Rocket Center, though, which we did in conjunction with a visit to the famous Huntsville Hamfest. And I stuffed myself full of the amazing Tex-Mex food at Rosie’s Mexican Cantina. Observing? Not much. Got out a couple of times to try to image the Moon with the ZWO, but the weather gods wouldn’t even allow that. September was a lot more fun than August. I did get some Moon pictures with ZWO and Edge 800 that month, but what was more funner was my trip to the Almost Heaven Star Party to resume my duties as one of their speakers after missing 2012 due to the cotton picking day job. I met Sky and Telescope Editor Bob Naeye at Washington National Airport (A.K.A. “Reagan”) in DC and we had a great time driving up into the mountains of West Virginia together. And an even better time at one of the nation’s great star parties. I admit I spent more time in the “hospitality area” of the field drinking and eating than I did actually observing –I’d brought my 70mm binoculars along—but that was just OK. Little Debbie still rules (inside joke, y’all). October turned out to be another semi-off month. Technically, it was the month of the 2013 Deep South Regional Star Gaze, but since that didn't begin till the tail end of the month, the 30th, the blog-report on it didn't come out till November. It wasn’t all dreary, though. We got out to the Escambia Amateur Astronomers’ Association meeting in Pensacola to hear Doc Clay Sherrod’s yearly address to the club. It’s nice to be able to spend some time with our old friends, Doc and wife Patsy, once a year. November was Deep South time and it was a heck of a good one this year. Even though the 2013 Deep South Regional Star Gaze didn't start out good. The clouds and storms that had been assaulting us since May weren't ready to give up quite yet. Wednesday was cloudy, and Thursday brought torrential rains. Friday, though? Friday was fraking spectacular. The Edge 800 and I brought home over 100 deep sky objects, including 77 Arp galaxies. Friday was also the day Miss Dorothy won her biggest star party prize ever, a beautiful Explore Scientific 4-inch refractor. We did visual observing with it like crazy Saturday night and only stopped when the sky conditions began to degrade and I began to worry about packing and the drive home Sunday morning. Object of the night? There were so many…but maybe the North America Nebula in the huge field of the OIII filter equipped 35mm Panoptic eyepiece. Observing was only the tip of the dadburned iceberg. The food was great, the accommodations good—we even had reliable Internet this year—and Halloween night was fun despite the rain (we screened the Rocky Horror Picture Show). Best of all, we got to hang out with the friends we've been observing with for twenty years. It’s no exaggeration to say DSRSG was the savior of a mostly clouded-out fall observing season. After a November that seemed to herald better weather, the clouds were back. Sigh. Oh, I got out a couple of times, but wasn’t able to get much accomplished. About all I did accomplish, in fact, was that after a couple of cloudy December 24ths I was able to get my traditional Christmas Even look at M42. Which brings us all the way back around, muchachos. What’s the straight poop on 2014? I don't have any resolutions, really. I do hope to get out with the scopes more often than I did last year, but that can only happen if the dadgum weatherman begins to cooperate. 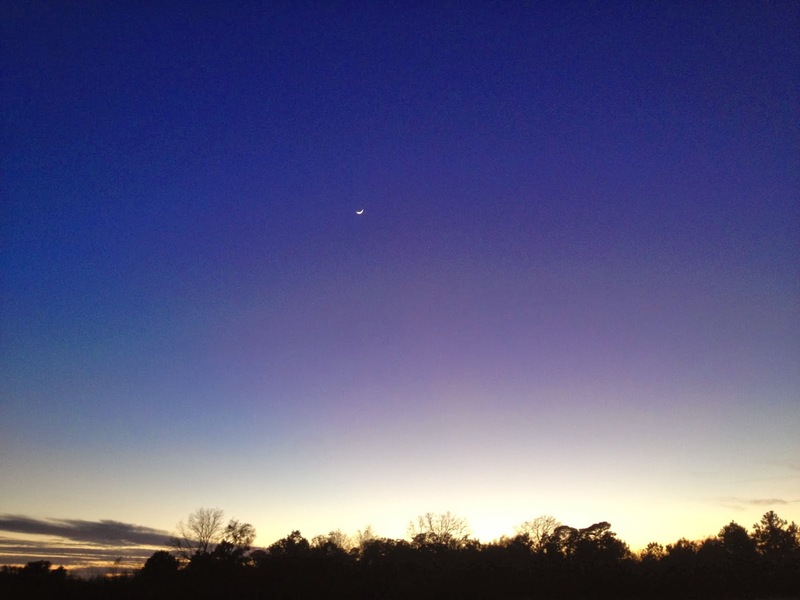 Up next is one of our fave annual events, the Possum Swamp Astronomical Society Post Christmas Banquet. But the next real biggie on the calendar is our New Year's Chiefland jaunt. I don’t mind saying I am going stir-crazy under clouds and am really, really looking forward to that.